You are warmly invited to the next instalment of Poor Image Projects. 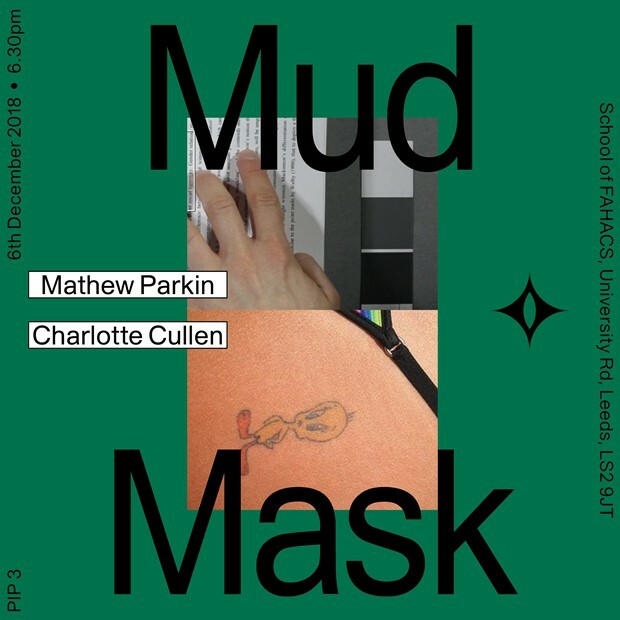 For this one-off event, we will be joined by artists Mathew Parkin and Charlotte Cullen. The event will take the format of a screening programme of recent moving-image work by Parkin which will be interspersed by a series of responses to these works by Cullen. Poor Image Projects is an event series showcasing audio-visual and moving image art forms. Each instalment of PIP presents a different artistic perspective on the manifold forms and functions of the moving image and audio-visual media. Technical, tactile, high-definition, analogue, computer generated, sensual, ubiquitous and poor— PIP aims to acknowledge the multiplicity of AV expression and how this materialises in both artistic and everyday contexts. The format of PIP events is fluid, shifting between screenings, flash-exhibitions, performances and artist talks. In response to the temporary nature of inner-city event spaces and the inherent mobility of AV media, PIP is nomadic, unfolding in different locations in and around Leeds. Poor Image Projects is led by artists Bethan Hughes and Anya Stewart-Maggs; it is kindly sponsored by Lumen and supported by Axis Web. Additional thanks go to Jamie Hudson and CAVE.